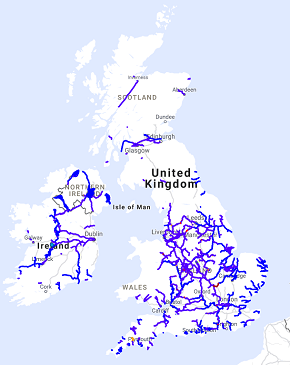 RailMapOnline.com provides interactive maps of past & present railways. Click on the maps below to start exploring. US Map: NV northwest counties detailed. UK Map: Bradford & Keighley redrawn. Canals: Llangollen Canal and Montgomeryshire Canal features added. US Map: Whatcom county, WA added, which completes Washington State. US Map: Clark county, NV (Las Vegas) detailed. UK Map: Sunderland & Washington redrawn. US Map: Skagit, Snohomish, Clallam, Jefferson, Kitsap counties, WA added. UK Map: South Shields & Jarrow redrawn. UK Map: Middlesbrough & Redcar redrawn. UK Map: Alnwick, Alnmouth & Amble redrawn. US Map: King County (Seattle), WA added, including more logging lines and streetcars. US Map: Pierce (Tacoma), Thurston (Olympia), Mason, Grays Harbour, WA added. Also San Francisco, Spokane historic streetcars added. And Portland detailed. US Map: Colusa, Glenn, Butte counties, CA redrawn. UK Map: Detail for Hartlepool, Stockton & Port Clarence. Also Castleford, Wath, Pontefract and York. 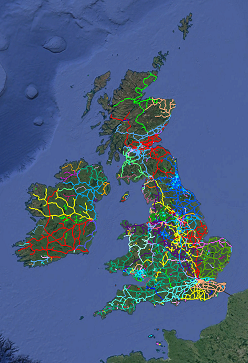 UK Map: Modern Rly layer updated - new download of OSM data. Canals: Gloucester & Sharpness Canal get updated with features added. Canals: Lee Navigation & Stort Navigation get updated with features added. US Map: Legend entries for Nevada added. 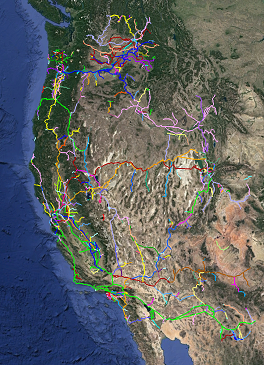 US Map: Also added the Freeport RR (Sacramento), thanks to John for suggesting the line.